张畅, 陈新军. 基于灰色系统的澳洲鲐太平洋群系资源量预测模型[J]. 上海海洋大学学报, 2019, 28(1): 154-160. ZHANG Chang, CHEN Xinjun. Forecasting model for spotted mackerel biomass based on grey system theory[J]. Journal of Shanghai Ocean University, 2019, 28(1): 154-160. 李建生, 严利平, 胡芬. 2004年夏季东海南部海域围网渔业生产动态[J]. 渔业信息与战略, 2005, 20(7): 19-21. 王凯, 严利平, 程家骅, 等. 东海鲐鱼资源合理利用的研究[J]. 海洋渔业, 2007, 29(4): 337-343. NASHIDA K, HONDA H, SAKAJI H, et al. 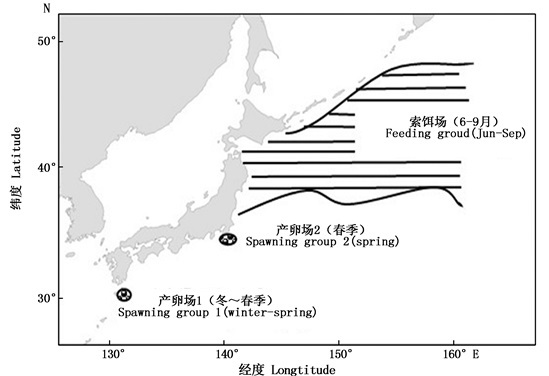 Migration of spotted mackerel Scomber australasicus estimated from a tagging experiment off Ashizuri cape and around the Izu Islands, central and Southern Pacific Coast of Japan[J]. Bulletin of Fisheries Research Agency, 2006. TAKASUKA A. Multi-species regime shifts reflected in spawning temperature optima of small pelagic fish in the western North Pacific[J]. Marine Ecology Progress, 2008, 360(1): 211-217. 陈新军. 灰色系统理论[M]. 北京: 中国农业出版社, 2003: 26-128. CHEN X J. Grey System Theory[M]. Beijing: China Agriculture Press, 2003: 26-128. 白福臣. 灰色GM(1, N)模型在广东海洋经济预测中的应用[J]. 技术经济与管理研究, 2009(2): 9-11. 陈新军, 周应祺. 中国海洋渔业人力资源结构的灰色分析及其预测[J]. 湛江海洋大学学报, 2001, 21(1): 22-29. 周元建, 关则良. 海洋渔业产量的灰色预测与分析[J]. 湛江水产学院学报, 1994(1): 53-55. ZHOU Y J, GUAN Z L. Forecasting and analysing of poduction of marine fisheries[J]. Journal of Guangdong Ocean University, 1994(1): 53-55. 上龍嗣, 渡邊千夏子, 上村泰洋, 等. 平成27(2015)年度ゴマサバ太平洋系群の資源評価[J]. 日本:中央水産研究所, 2015, 16-20. RYUGAUJI, CHINAKO W, UEMURA Y, et al. Resource evaluation of spotted mackerel Pacific group in 2015[J]. Japan:Central Fisheries Research Institute, 2015, 16-20. 陈新军, 曹杰, 田思泉, 等. 表温和黑潮年间变化对西北太平洋柔鱼渔场分布的影响[J]. 大连海洋大学学报, 2010, 25(2): 119-126. 李曰嵩, 潘灵芝, 严利平, 等. 基于个体模型的东海鲐鱼渔场形成机制研究[J]. 海洋学报, 2014, 36(6): 67-74. 沈建华, 韩士鑫, 樊伟, 等. 西北太平洋秋刀鱼资源及其渔场[J]. 海洋渔业, 2004, 26(1): 61-65. 杨修群, 朱益民, 谢倩, 等. 太平洋年代际振荡的研究进展[J]. 大气科学, 2004, 28(6): 979-992. 吕俊梅, 琚建华, 张庆云, 等. 太平洋海温场两种不同时间尺度气候模态的分析[J]. 海洋学报, 2005, 27(5): 30-37. 唐启义. DPS数据处理系统[M]. 北京: 科学出版社, 2017: 1422-1436. TANG Q Y. DPS data processing system[M]. Beijing: Science Press, 2017: 1422-1436. 李纲, 陈新军. 东海鲐鱼资源和渔场时空分布特征的研究[J]. 中国海洋大学学报, 2007, 37(6): 921-926. LI G, CHEN X J. Tempo-spatial characteristic analysis of the mackerel resource and its fishing ground in the East China Sea[J]. Periodical of Ocean University of China, 2007, 37(6): 921-926. 李纲, 陈新军, 官文江, 等. 东黄海鲐鱼资源评估与管理决策研究[M]. 北京: 科学出版社, 2011: 15-23. LI G, CHEN X J, GUAN W J, et al. Fish resource assessment and management decision research in east yellow sea[M]. Beijing: Science Press, 2011: 15-23. 缪圣赐. 2005年韩国9鱼种的总容许渔获量(TAG)为215, 983t同比减少1%[J]. 现代渔业信息, 2005, 20(3): 34-34. MIAO S C. In 2005, the total allowable fishing allowance (TAG) of 9 fish species in South Korea was 215983 t, 1 percent less than the previous year[J]. Journal of Modern Fisheries Information, 2005, 20(3): 34-34. 肖新平, 毛树华. 灰预测与决策方法[M]. 北京: 科学出版社, 2013: 183-277. XIAO X P, MAO S H. Grey prediction and decision making method[M]. Beijing: Science Press, 2013: 183-277. 凌建忠, 李圣法, 严利平. 东海区主要渔业资源利用状况的分析[J]. 海洋渔业, 2006, 28(2): 111-116. 郑元甲, 陈雪忠, 程家骅, 等. 东海大陆架生物资源与环境[M]. 上海: 上海科学技术出版社, 2003. ZHENG Y J, CHEN X Z, CHENG J H, et al. Biological resources and environment on the east China sea shelf[M]. Shanghai: Shanghai Scientific and Technical Publishers, 2003. 王云龙, 沈新强, 李纯厚, 等. 中国大陆架及邻近海域浮游生物[M]. 上海: 上海科学技术出版社, 2005: 133-142. WANG Y L, SHEN X Q, LI C H, et al. The plankton in Chinese continental shelf and the adjacent waters[M]. Shanghai: Shanghai Scientific and Technical Publishers, 2005: 133-142. 李建生, 严利平, 程家骅. 2006年夏秋季东海群系澳洲鲐数量分布特征[J]. 海洋渔业, 2008, 30(1): 49-55. 李建生, 严利平, 胡芬. 夏秋季东海中部和南部海域澳洲鲐渔汛和渔场的年际变化[J]. 中国水产科学, 2011, 18(1): 178-184. LI J S, YAN L P, HU F. Annual change of spotted mackerel Scomber australasicus fishing sea-son and fishing grounds in central and southern East China Sea in summer and autumn[J]. Journal of Fishery Sciences of China, 2011, 18(1): 178-184. 陈新军. 渔业资源与渔场学[M]. 北京: 海洋出版社, 2007: 149-153. CHEN X J. Fishery resources and fisheries[M]. Beijing: China Ocean Press, 2007: 149-153. KONDO K. Growth of Japanese Mackerel-Ⅱ. Age determination with use of scales[J]. Bulletin of Tohoku Regional Fisheries Research Laboratory, 1966, 47: 31-53. LIZUKA K, Hamasaki S. Ecology of common mackerel (Scomber japonicas) in the southwestern Japan Sea and the East China Sea, 1:Change of fishing grounds and catch fluctuation[J]. Bulletin of the Seikai Regional Fisheries Research Laboratory, 1983. Abstract: GM (1, n) is established by the Spotted mackerel (Scomber australasicus) resources of the Pacific group which is supplied by Japan's central fisheries research institute from 1995 to 2012, combined with the sea surface temperature (SST) of spawning and feeding ground and tidal range. There are six models:GM(1, 1) without environmental factor; four GM (1, 2) models established by the SSTs of the feeding ground(140°E-160°E, 35°N-50°N, SST1), spawning ground1(130°E-132°E, 30°N-32°N, SST2), spawning ground2(138°E-141°E, 34°N-35°N, SST3)and tidal range of Kuroshio; GM (1, 5) established by all the factors. The average error of each model is 6.72%, 3.73%, 4.41%, 4.78%, 29.56% and 19.38% respectively. The results show that the GM models based on feeding and spawning grounds temperature have a high accuracy in the spotted mackerel resource forecast, and can be used into more researches. By analyzing the gray parameters a and b, it is concluded that the SST2 and SST3 are the most restrictive to the model, which means the fluctuation of those factors had the greatest effect on the amount, and the temperature of spawning ground has a high correlation with the resources. When compared with the optimum temperature, it is presumed that the mackerel resources in the appropriate temperature range can increase with the temperature of the spawning ground. The global warming and gradual increase of SST are likely to have a positive effect on the spotted mackerel stock.